Chinese “big-character posters,” or dazibao, are handwritten posters mounted on walls and published in papers or pamphlets to communicate protest or launch ideas into public discourse. During the era of Mao Zedong, throughout the Great Leap Forward and the beginning of the Cultural Revolution, dazibao were part of mass campaigns directed by the Communist Party. As the Cultural Revolution wore on, the posters began to appear widely, conveying everything from satire to denunciation, sometimes used as weapons of aggressive personal attacks which cost the targets their jobs. Recognized as an important propaganda tool, these posters attracted the attention of U.S. diplomats, and of journalists who published photos of them as the U.S. and China were normalizing the bilateral relationship. The posters reflected political development in mainland China, including a movement towards democratization.In interviews with Charles Stuart Kennedy, Donald M. Anderson (interviewed beginning in July 1992), Dennis G. Harter (March 2004) and William W. Thomas Jr. (May 1994) shared their experiences of encountering and interpreting dazibao as barometers of political trends. Read about the art of China watching during the Great Leap Forward and other Moments on China. There was a period during that time when big-character posters were put up, a form of expression that the Chinese [government] permitted from time to time. We would go out and literally spend hours just standing in front of a wall reading the big-character posters, then exchanging notes with western journalists who were out doing the same thing, and collecting as much information as we could that way…The journalists were much more open about photographing, and this sort of thing. So we worked out a deal to acquire those. THOMAS: When we first arrived in 1975 there weren’t many wall posters, but we discovered later they were of great significance. We would take a different route going to work every morning, riding bicycles mainly so that we could see if there were any new posters up. We found out that Hua Guofeng was Chairman of the Party by going through our hospital courtyard and looking at all the new signs that were up. At first the Party people felt they had enough support where they could do this without too much risk. Later others decided the risk was not too bad and they might get punished anyway, so they were more free about wall posters. The posters’ areas were chosen because of their conspicuousness. For example, the poster for the big 1976 demonstration for Zhou En-lai was put on a certain monument because it has Zhou En-lai’s calligraphy on it and therefore everybody would know that this was support for Zhou En-lai who happened to be dead at the time. There was frankness in the wall posters that we hadn’t seen before in China. Throughout 1976, for the entire year, it was very prolific in wall posters and a lot of political information was available this way and through no other way. HARTER: At this time there were a number of very well-known poster-writers, like Wei Jinsheng (seen left), who achieved great readership not only in China but outside, because the journalists who were in China all began to go out with their interpreters to photograph, to copy down the posters, translate them and publish them abroad. So, you had big articles coming out of The New York Times, The Washington Post, and LA Times all about these wall posters. 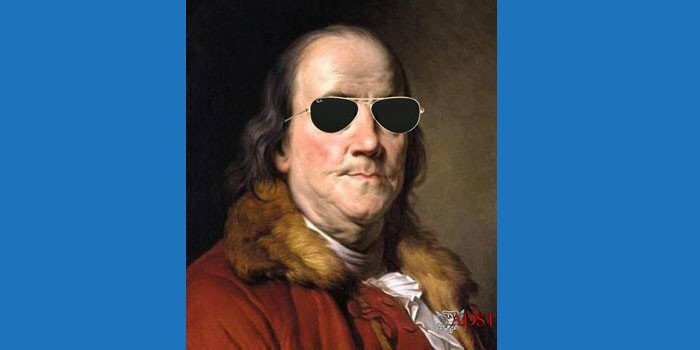 It was a tremendous art form then – historical allegories, cartoons, satires, and of course the written word. I still have a collection of photographs that were informally taken in Beijing and Shanghai and a few other provincial cities depicting wall posters and people reading them. This included the period when Deng was purged by the Gang of Four and then the posters when they ended up purging Jiang Qing, Mao’s wife, and the other members of the Gang of Four. The caricatures of the Gang of Four were particularly lively and imaginative. Some also cover posters from the democracy movement, which occurred later. This was a period of tremendous change and upheaval, and you knew that what was being written at the universities and on the streets was being read, and read probably by people at very high levels. It was a difficult to do analysis of developments in China, but we regularly received commendations for our analytical work from the East Asia Bureau, from the Secretary and other people in Washington. So we had a pretty good audience for our reporting. The wall posters had been used in the past and in the ‘50s and ‘60s to purge those already discredited by the Party authorities and to develop mass support for the campaigns. In the early days, these were part of the mass campaigns organized by the Party – sloganeering for the Great Leap Forward, the anti-Soviet campaigns and of course the Cultural Revolution itself. 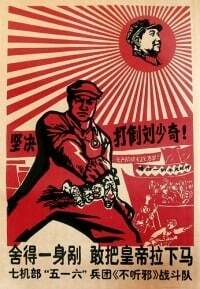 During the Cultural Revolution you had people targeted by personal attacks and posters, but they were largely part of party-run effort more than expressions of public concern or criticism…During the seventies, the poster campaigns were designed to generate public support for the downfall of the Gang of Four. They used all sorts of caricatures of the people being criticized. Because Jiang Qing had been a 1930s movie actress and then, as Mao’s wife, associated with a series of dramas, operas, ballets to commemorate the revolutionary spirit, she was portrayed and written up as “the white-boned demon” a traditional opera figure. Posters showed a caricature of her head on top of the body of a snake. Then written below these drawings would be the criticisms of specific actions she had taken, to purge good people, to elevate her cronies, to undermine Mao and the revolution etc. During this period, there was certainly no critique of Chairman Mao, as there would be later on, and many of the posters continued to praise his contributions while pointing out how Madame Mao had distracted him and corrupted his policies. It was only later that the posters became more of a public expression of intensity or even rebellion. That was most evident during the Democracy Wall movement and again later in the 1980s after the death of Hu Yaobang which led to the Tiananmen demonstrations in 1989. But the involvement of students and ordinary people in the poster writing campaigns of the late 1970s were clearly the start of this form of individual or group expression and the start of real criticism of the government and the party. There was a certain amount of democracy. There were people who did begin to put up their posters, because they felt that this was a part of a new openness. 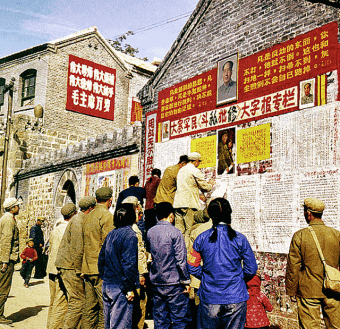 Individuals were putting up posters and student units at the universities were putting up posters during the period, particularly in the latter phases when the Gang of Four was purged and Deng Xiaoping came back. There were discussions of political change. Deng had proposed major changes and “four modernizations” for China – agriculture, industry, science and technology and national defense — at the end of 1978. 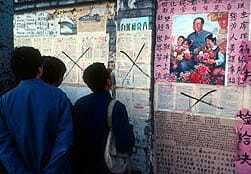 And then Wei Jinsheng put up a poster on the “Fifth Modernization,” Democracy. It was posted on a wall outside of Beijing University and that became the center for this sort of expression. The location became known as Democracy Wall and activities there just grew and grew. The Chinese media made much of Deng’s early post-Liberation slogans – “seek truth from facts” and “it doesn’t matter if a cat is black or white so long as it catches mice” – and the students took these slogans as the impetus for spelling out all sorts of complaints about the Party and how the people were being treated. Unfortunately, because the party and government leaders were not ready – the government and party personnel were still largely synonymous – the Beijing University location was gradually closed down and the posters were moved to a more obscure location where, to enter, one had to register. The wall posters there died out by the end of l979. There was no indication the leadership was ready for any real relaxation of control, and there was certainly no commitment to a western style of democracy. There had been a change of people at the top and a greater flexibility in how these new people wanted to deal with the rest of the world for China’s economic benefit, but there was certainly no intention to move for political change. There was no plan to change anything politically. So, Deng and the others said “enough is enough” and they just closed it all down and arrested people and sentenced them to long terms in jail. There were appeals for democracy and freedom, as well as named criticisms of some of the leaders for their politics, particularly during the Cultural Revolution. The posters in these instances served the Party well, as it made it easier to eliminate leaders who had been “leftists” in the Cultural Revolution but who tried to hold on to their positions afterward.